The Plants vs Zombies game has been a fan favourite in the app stores of both ios and android ever since it got released. Now, the developer EA Swiss Sarl brings us the sequel to the major hit and does not fail to once again woo the audience. With subtle changes in the menus, animation and gameplay, the studio manages to successfully employ their experience and skill with the franchise to produce a package worth waiting the 10 minutes it takes to download the game. With that being said let’s get into the nit and grit of things. Unlike its prequel, the game has you taking a trip through time to the ages of the ancient pyramids, looting pirates of the seven seas and cowboys from the wild west in the shoes of the recurring character Crazy Dave who is searching for his taco, yes that’s right his taco. His quest for the Mexican delight sees him and his time travelling talking truck Penny taking on zombies whilst uncovering the evil plans of Dr. Zomboss. Each world is theme specific and has zombies dressed to fit the theme. The game takes advantage of these different worlds and employs additions specific to those worlds’ themes, thus creating new ways to strategize as well as making each world unique and not utterly monotonous to play in. The game has been delightfully polished with new, crisp animations, plant and zombie specific sound effects and much improved graphics. An additional bonus is that the game is optimised for tablets so all the folks out there with large slates can enjoy the game in all its crystal clear goodness. All the characters have been spruced up to look more vibrant and colourful, a much appreciated improvement from the relatively dull shades of the prequel. As you play through the game, you can also unlock different costumes for your plant characters. Though the game is awfully addictive to play, the soundtrack remains as a persistent bugger. I often found the monotonous jingles a tad bit annoying during long playthroughs and found myself muting the music. Initially though, the soundtrack does not seem that bad. 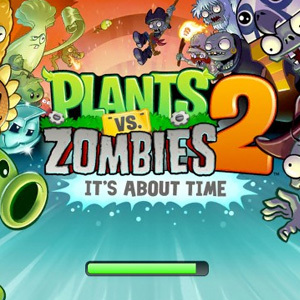 The sequel to the addictive puzzle game stays true to its roots with the gameplay, any returning player to the franchise can jump right in as the core mechanics have remained largely unchanged; you pick your plants, you plant your little buds and you fend off wave after wave of zombies that have an unusually undying appetite for your brains. New players can learn the basics within minutes as the game takes you through a few levels aimed to show how things roll. These were the basics of Plants Vs Zombies and have been carried through to the sequel. However, the developer has added certain new touches to the game mechanics such as the addition of power-ups and plant food (a substance that supercharges a plant for a few seconds). The power-ups seem to be an unnecessary addition and feel like a cheap way to get out of a tough situation; in fact I have not once found myself in the need of a power-up. Moreover they need to be bought with coins, something very hard to accumulate. The plant food though adds a whole new level to your game plan, providing you with a trump card that you can hold on to until just the right moment. Other than that, the game ran smoothly throughout my one week long test and did not lag even once! That too on my aging Galaxy Tab 7.0+! Crashing was not witnessed either, nor were any bugs or glitches. The fact that the developers pushed out a game this smooth and stable to audiences free of cost is itself a marvel deserving a round of applause. Plants Vs Zombies – 2: It’s About Time is not too far off from the original but has enough changes and additions to warrant the release of a second version. The most amazing fact is that the game is free to download, unlike its predecessor which is still charging money for its purchase. Where the developers provide you the game for free, they make up for it with the prospects of tons of in-app-purchases. Sadly though, they have left certain classic characters available only via purchase for 3$. Though the game’s fundamentals are the same, at times certain levels can seem to be too daunting and near impossible to pass unless you make exact, precise moves. 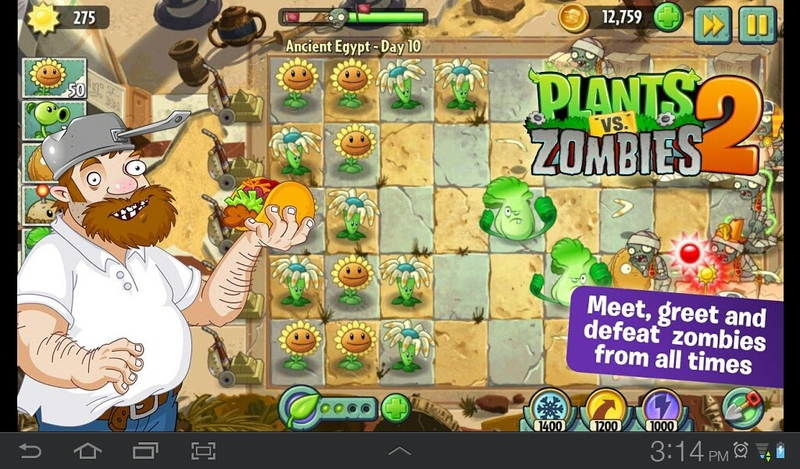 Nevertheless, Plants Vs Zombies – 2: It’s About Time is a brilliantly addictive game with a very neat and polished design and tried and tested game-play. All EA Swiss Sarl did was that they took a formula that worked excellently and just made it better. Overall the game is a must-download on my list and deserves to occupy a block in your app drawer.